Yes, he did it–and with permits. Here’s a link. If it WERE Paris, Hollywoodland would be an enormous, flat public park with no houses in it. And the Hollywood Sign would be called the Eiffel Tower. But it’s not, and it’s not. I would have thought this was obvious. The monument that is mentioned most frequently in conversations about the Hollywood Sign is the Eiffel Tower, and for good reason. Both became icons by accident, having been conceived as temporary structures, and grew to represent the cities in which they are located. Both were built during the Machine Age and project the dynamism of that era. Finally, both monuments are abstract symbols, allowing their admirers to imbue them with a variety of meanings. Just as the Hollywood Sign can symbolize the movie industry, fame, or its physical location, the Eiffel Tower can embody the Belle Epoque, the City of Paris or a triumph of engineering. There are, however, important differences. 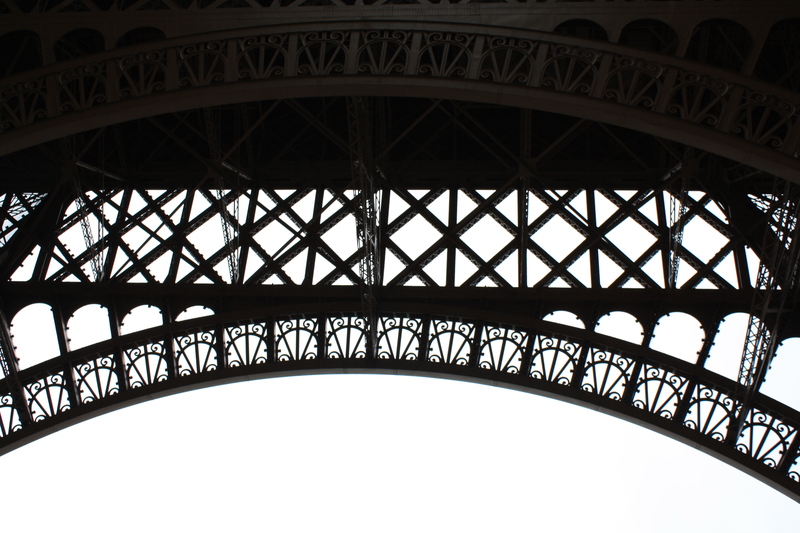 While Gustave Eiffel’s iron masterpiece wasn’t supposed to be permanent, it certainly looks as if it were built for the ages. 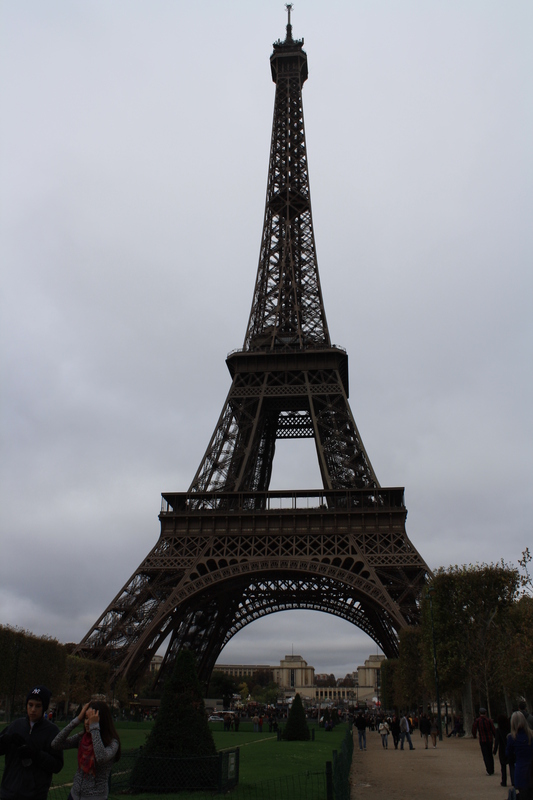 An engineering marvel, it was the tallest man-made structure in the world upon its completion in 1889. Its base, particularly the curved spans that support its legs, somehow manages to be both massive and delicate. To stand under it, as I did during a recent visit, is to see a breathtaking array of lacy patterns whose beauty belies their strength. As charming as the Tower is from a distance, it provides an even greater visual thrill a close range. 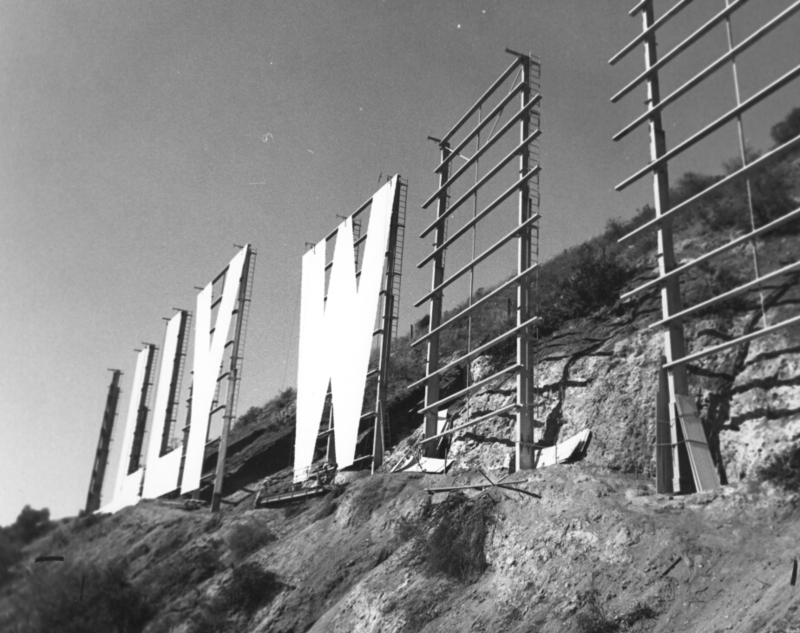 By contrast, in its original incarnation (1923-1978) the Hollywood Sign wasn’t engineered at all. The letters were anchored from behind by telephone poles, rather than bolted to a foundation. Unsurprisingly, over the years assorted letters were knocked down by windstorms and, in the case of the H, by an out-of-control car driven by the Sign’s caretaker, Albert Kothe. After the old Sign was torn down in 1978, its replacement–the present-day version–was skillfully engineered. Caissons were sunk into the bedrock, and the new corrugated steel letters were bolted to a heavy steel scaffolding. In its 33-year history, the current Sign has never moved, whether during earthquakes or windstorms, or required any repairs. 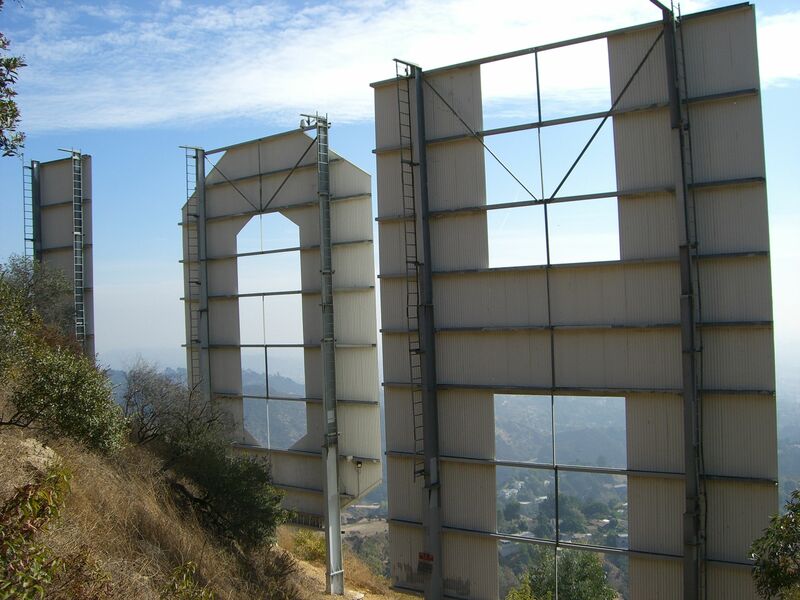 Perhaps because both my grandfathers were engineers, I have a great fondness for the back of the Hollywood Sign, where its support structure can be seen. The helicopter pilot on my aerial shoot told me that, to his knowledge, I was the only person who ever shot the back of the Sign. I also shot the back from the ground at close range, both on video and in still photos. The front of the Sign is another story. At close range, its corrugated steel resembles nothing more than an industrial fence, and projects the same appeal. The Hollywood Sign can only be appreciated at a distance, where its 45-foot letters can be read. Which brings me to another difference. The fact that the Hollywood Sign is composed of letters that make up a word sets it apart symbolically from the Eiffel Tower. Though both monuments represent modernity, the Sign’s “wordness” (to quote Leo Braudy) gives it an abstraction that goes beyond any meaning attributed to the Eiffel Tower. By virtue of its height, the Eiffel Tower projects a common message that the Hollywood Sign does not. Which, of course, explains the Sign’s appeal to tourists in search of a photo opportunity. 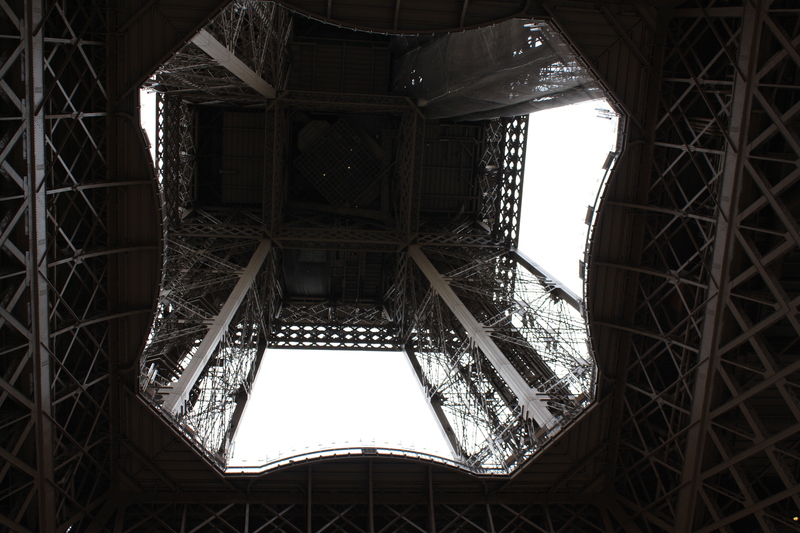 Standing in front of the Eiffel Tower, you’re an ant–albeit one that has traveled to Paris. 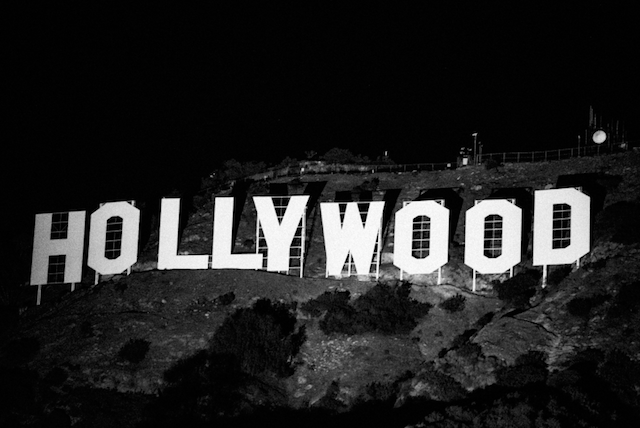 But in front of the blank white letters of the Hollywood Sign, it’s all about you, the potential Hollywood star. Preston Sturges, ages one to fourteen. His mother, Mary Dempsey, appears in pictures two and three./From "Preston Sturges on Preston Sturges," Touchstone copyright 1990. My mother was in no sense a liar, nor even intentionally unacquainted with the truth…as she knew it. She was, however, endowed with such a rich and powerful imagination that anything she had said three times, she believed ferverently. Often, twice was enough. When Mary Dempsey was between marriages, she took the 2 1/2-year-old Preston to Paris, where she ostensibly planned to study theater. On her first day in town, Mary met a Mrs. Duncan whose daughter, Isadora, was a dancer. Isadora Duncan and Mary Dempsey not only became instant best friends but maintained a lifelong bond that outlasted their many relationships with men. Though Mary soon returned to Chicago to marry Solomon Sturges, she managed to exact an agreement to live with him only half the year. The remainder of her time–which often stretched well beyond six months–would be spent in Europe, accompanying Isadora to Bayreuth and other venues. …everything was straightened out when we pulled into Cologne, where a soldier with a bayonet was guarding our pile of stuff, with the parrot insulting him in French. And yet, except that she chose the schools in which I was placed and made a few wise remarks which I remember with pleasure now but thought totally inconsequential at twelve, Mother had absolutely nothing to do with my development or what I grew into. Strangely, Father, though he was not my true progenitor, had very much more to do with the shaping of my character than Mother ever had. …I have suffered so many attacks of indigestion that I am well versed in the remedy: ingest a little Maalox, lie down, stretch out, and hope to God I don’t croak. You are currently browsing entries tagged with Paris at Under the Hollywood Sign.